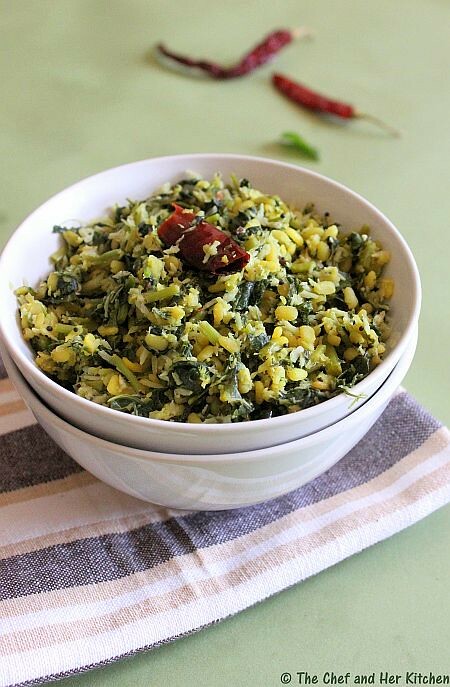 I prefer more greens in my daily food diet.Thotakura/Amaranth is one of my favorite greens as it is versatile and can be used in various preparations like Amaranth stir-fry,Dal,Pakora and Parathas.This is a very simple dry curry and is the most favorite of mine with these greens.A bite into moong dal and the flavors from coconut makes this curry absolutely delicious.It goes well with rice as well as roti. Heat oil in a kadai,crackle mustard seeds and jeera,add hing,red chilli,urad and chana dal and fry for a minute. Wash and soak moong dal for 10 mins. Add garlic pods,sliced onions and fry until it turns pink. 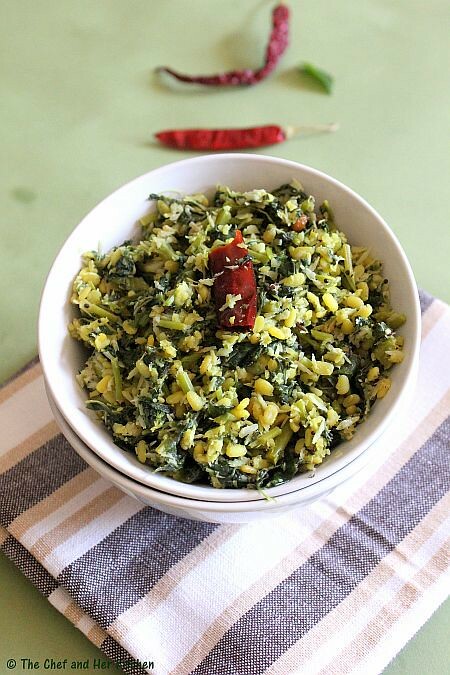 Add moong dal and fry for 2-3 mins,now add chopped amarnath leaves to it and cover with a deep plate and pour water over the plate.This will help in steam cooking,cook for 12-15 mins till the moong dal is cooked.Do not make moong dal mushy,it should be cooked and hold its shape. Grind coconut,green chillies and salt to a coarse paste and add this to the cooked curry and give a good stir to it and fry for 2 mins. Serve hot with Rice and papad or roti and dal. I am sending this to the sowmya's SWC: Cooking with greens Event which was originally started by Lakshmi. wow nice combi....must have tasted so nice with rice or even rotis :). Thats a delicious and healthy combo..looks yumm!! Very new to me,looks healthy! great combi...what a healthy dish. Thotakoora & pesaruppappu combination sounds very healthy and great to me. Thiss koora is a new to me, a must try one. Healthy and yummy combo! Love to have with steamed rice. Lovely recipe.I am not sure how these leaves look and not sure if its available here.Can i substitute this with spinach? Same pinch.. i too posted with greens.. lovely and healthy dish yaa.. Sounds very healthy and I have never added coocnut with spinach... gotta try your version!!! A Super healthy dish! I make a similar version with Methi.. I have no idea what this green is called here :( Will try it with palak! Healthy and unique dish... Wow! Never tried amaranth with moong dal. looks healthy and yummm, healthy filler with rice.. This looks so good! Really yummy and delicious. Very healthy and yummy dish. wow! 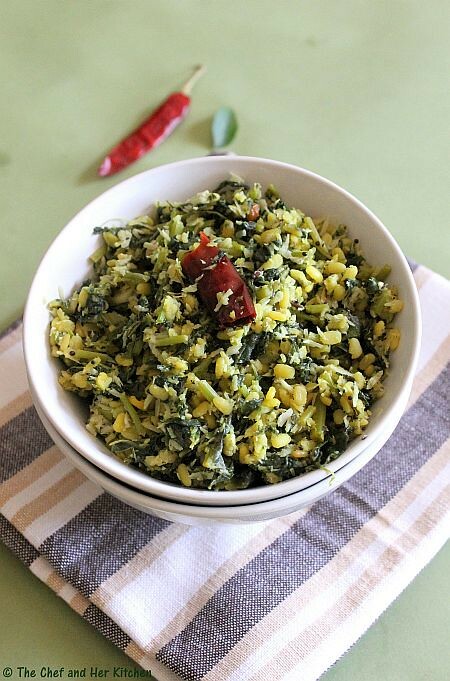 so healthy a side dish with greens and dhal. Looks great.